Our mission is to provide our students with a bilingual and international education. We believe the student’s education can be fully achieved within the context of a strong relationship of all the members in the learning process: students, teachers and families. Our School is a living community of educators and learners, where dialogue and good coexistence prevails, constituting a permanent team of ongoing learners in a frame of universally valid values. 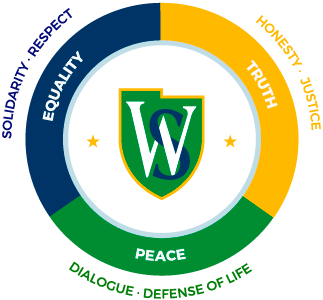 Washington School is a non-denominational institution where Staff and students belong to different religions. We propose an education where the student is seen as an active member of our society fostering the ongoing search of wellbeing so as to build a more peaceful world, in the context of mutual understanding and intercultural respect. Our aim is to educate happy young people with emotional skills, informed, avid of knowledge and able to act their true calling with social responsibility and conscious of the need to be protagonists as agents of change.